This is like a more consistent Goblin Blastmage for everyone. welcome to dragon cards, more consistent everything for everyone. Hilarious that when he attacks he says "Death to the pretenders" since he's a Fire Elemental pretender. It's a Lost Tallstrider with a 1-cost Darkbomb attached to it, and chances are you've got the dragon in your hand. What's not to like? if you can play him and make good use of the 3 damage, he's a great value card. Currently my favorite of the BRM cards, won me a lot of matches! Darkbomb on a 3-value body is nice. Really looking forward to this card! 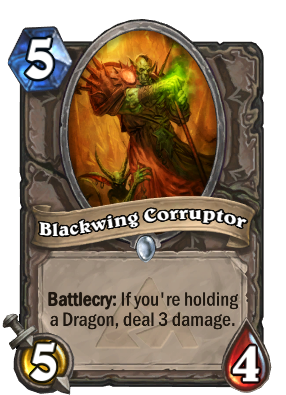 And the holding a Dragon restriction is even weaker for the 5-drop (compared to Blackwing Technician). I calculated some probabilites for Mulligan scenarios here: http://imgur.com/VGw8PGN I don't think you'll ever keep him in Mulligan, so you just think of the average number you keep with your favorite class and look these probabilities up: They do not include drawing the Blackwing Corruptor, though. But if you don't have it, you don't play it. :) I myself think, that they are decent from 3 Dragons on which is interesting since you don't have to entirely commit to Dragons to play this guy. It's a bit more difficult to play it with cheaper dragons though since it contests the Azure Drake on the 5-spot. It's quite sad that everyone else can play a turn 5 lesser Fire Elemental, while Shaman is highly unlikely to be able to, because Shaman have to overload on certain turn and if you don't overload on turn 4, your foe can press on and force you to overload on turn 5, making a turn 6 Fire Elemental unavailable. Now it's even damned harder. To play this 5/4 you must not overload on turn 4. A perfect tempo would be turn 5 corruptor then turn 6 classic fire ele. In a competitive game it won't be this easy. Don't worry about Dragon in hand though, as Shaman does have Azure Drake and tends to hold it in hand. EXECUTE_1 TWITCH IS FOR TWITCH! Am I the only one that feels the "holding a dragon" requirement isn't really that big of a deal? With all the big legionaries being dragons, it seems that all cards will this mechanic will be able to function quite frequently.